These large birds, who fly great distances across continents, have three remarkable qualities. First, they rotate leadership. No one bird stays out in front all the time. Second, they choose leaders who can handle the turbulence. And then, all during the time one bird is leading, the rest are honking their affirmation. That’s not a bad model for the church. Certainly we need leaders who can handle turbulence and who are aware that leadership ought to be shared. But most of all, we need a church where we are all honking encouragement. 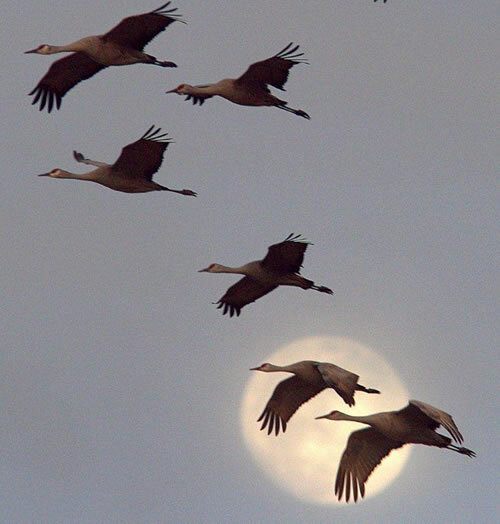 This entry was posted in Christian Living, Church, Leadership and tagged 1 Thessalonians 5:11, Bruce Larson, encouragement, illustration, migration, sandhill cranes, Wind and Fire. Bookmark the permalink.